To raise awareness of the risks of drink driving. To remind people of the fun they can have on the way home instead of drink driving. To encourage people to have a safe journey home. The campaign ran around Christmas 2017, to raise awareness of the risks of drink driving. It was targeted at young people in particular (those aged under 30), who are at the greatest risk of drink driving in the UK. Digital media was chosen as it is the best way to engage with the target group. 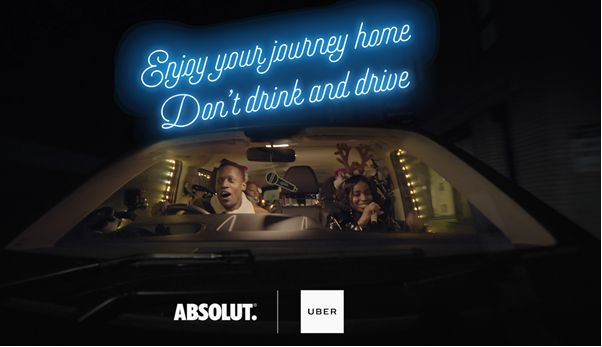 The campaign saw the brand Absolut and taxi firm Uber partner together to produce the fun video which encouraged revellers to celebrate “one of the best moments of a night out” – the journey home safely, in a way that they could relate to. The highlight being how much fun journeys home should be. Fuelled by the trend of people having a sing-a-long on the way home, the video captured different groups of friends and family being picked up and surprised by what they found in an Absolut-branded ‘Karaoke Uber’. Carrying the core proposition “Enjoy your journey home. Don’t drink and drive”, it showed people having a sing-along on the way home, in an Uber cab decked out with a karaoke machine, disco ball, Christmas lights, and props. Uber helped to incentivise consumers to make a sensible choice, by offering a £10 discount off a first ride for new users. The short video was seeded on social media, particularly Facebook and Instagram, throughout the festive period. The campaign proved popular in terms of reach, with users proactively sharing it, and earned media coverage. It delivered approximately 7.3 million impressions in total, across Facebook, YouTube, via the Uber app, and press coverage.